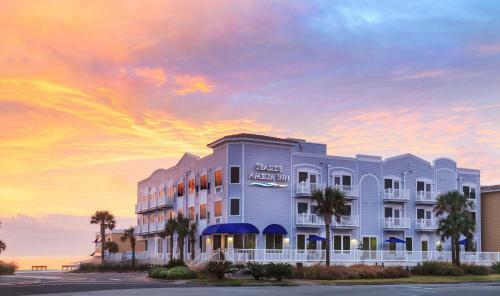 Discover one of Amelia Island's newest inns located beach-side on the Atlantic Ocean. A charming coastal retreat, Seaside Amelia Inn is a wonderful oceanfront boutique hotel. Begin each day with a satisfying complimentary breakfast. Enjoy our oceanfront rooftop terrace available 24 hours to our guests and perfect for hosting small groups. Our inn also has small conference rooms that can accommodate small corporate meetings. When not on the beach, enjoy our outdoor courtyard and pool deck. Just a short ride from Jacksonville, Florida, and located only a few blocks from historic downtown Fernandina Beach, you can take the time to discover the little things that make this island a special place to vacation.